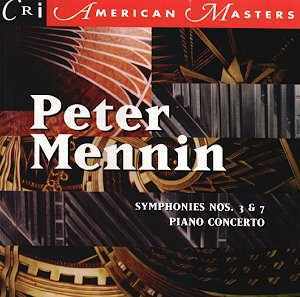 Oft condemned for allegedly 'three-piece-suit' commissioned symphonies, Mennin is well and generously represented on this CRI disc. Mennin had a stainless steel reputation as an academic and especially as an administrator. Rather like Britten he delivered to the commission timetable. An air of safe predictability seems to have been fabricated around his work. The three works recorded here confound that reputation. The ageing Mitropoulos leads the New Yorkers in a hair-raising electric-chair of a performance. Third Symphonies in the USA seem to have done rather well and often in association with the NYPO (look at Schuman, Harris, Copland). Hiss has been largely defeated by CRI's music-friendly processing staff. We are left with a work that heaves in a torment of restless emotions. Apart from 'obvious influences' such as Schuman and Roy Harris I was also reminded more than several times of the Vaughan Williams symphonies (6, 7 and 8). The finale's alert heroism casts glances back to the turmoil of the first movement with echoes of Walton 1, Stravinsky's Rite and some thunderous brass work mingling with the unease of lyrical Western Americana. This is not at all hard-going. The storm clouds evocative held notes of the strings at the beginning of the piano concerto soon give way to a plangent contribution from the piano reminiscent of Martinu's Toccata e Due Canzoni. The abrasive raw nerve-end energy with which the work clamours is close to Shostakovich in spirit but cross-bred with a tumbling and hurtling jazziness. Once again I detected a Waltonian spirit (Sinfonia Concertante). Ogdon is breathtakingly magnificent and the orchestral contribution gives every sign of having been carefully rehearsed without sacrificing spontaneity. The central adagio religioso sounds rather like a time-delayed focus-distorted version of the first section of Finzi's Eclogue. The seventh symphony dates from more than fifteen years after the third. Its five movements are deployed over approximately half an hour. The introductory adagio is very peaceful; a total contrast with the clamorous clangour of the succeeding Allegro (almost five minutes of jet-stream 'mechanismo'). The following Andante returns to the uncertain tonalities of the first movement and this continues into the Moderato (IV). The final Allegro Vivace starts calmly enough but soon conflict breaks free and eddies and currents of anarchic energy are set free across the aural landscape. This is certainly the toughest work on the disk though always rooted in lyricism. The English-only notes are by Walter Simmons. The performer line-up could hardly be more impressive so there can be little question that Mennin was sold short in these recordings. Indeed in the case of all of these pieces it is difficult to imagine the performances being improved on. Enthusiastically and unreservedly recommended - especially for the piano concerto and the earlier symphony.